Pancreatic ductal adenocarcinoma remains an incurable disease with a poor prognosis and life expectancy. Malignant pancreatic cancer is a significant cause of cancer-related mortality. The BxPC-3 tumorigenic epithelial cell line was initially derived from a 61-year-old female patient with pancreatic adenocarcinoma. Proliferator-activated receptor-γ (PPAR-γ) is a nuclear receptor that inhibits various cancer cell processes, including pancreatic cancer cell proliferation. A 2014 study by Ninomiya et al. published in Oncology Letters investigated the inhibitory effect of pioglitazone on the proliferation of the BxPC-3 pancreatic cancer cell line in vitro and in vivo. The article reported that pioglitazone induces CEA mRNA expression, suppresses IL 8 and COX 2 mRNA expression in vitro, and inhibits BxPC-3 xenograft growth. These findings indicate that pioglitazone treatment blocks the proliferation and metastasis of pancreatic cancer cells and could be useful for the patients in preventing pancreatic cancer metastases. A 2007 Molecular Cancer Therapeutics study by Yip-Schneider et al. used the BxPC3 model to investigate the antitumor effects of combination therapy with sulindac, a COX inhibitor, and LC-1, an analogue of the NF-κB inhibition-associated compound parthenolide. Results indicated the treatment had evidence for preclinical efficacy and that antitumor effects are mediated through cyclin D1 levels. A 2010 Molecular Cancer Therapy article (Yu et al.) used the BxPC-3 xenograft model to study the therapeutic efficacy of GLV-1h68, a replication-competent vaccinia virus. Results demonstrated that the virus was able to successfully and selectively infect tumor cells, replicate, and lyse the tumor cells. Combination therapy with cisplatin or gemcitabine also enhanced and accelerated antitumor effects; the mechanism is suggested to be related to a proinflammatory immune response. Finally, Lu et al. (2008) used the BxPC-3 cell model to characterize the mechanism of erlotinib, a small molecule EGFR tyrosine kinase inhibitor. Findings demonstrated that both in vitro and in vivo erlotinib treatment inhibited growth with increased apoptosis and decreased angiogenesis. 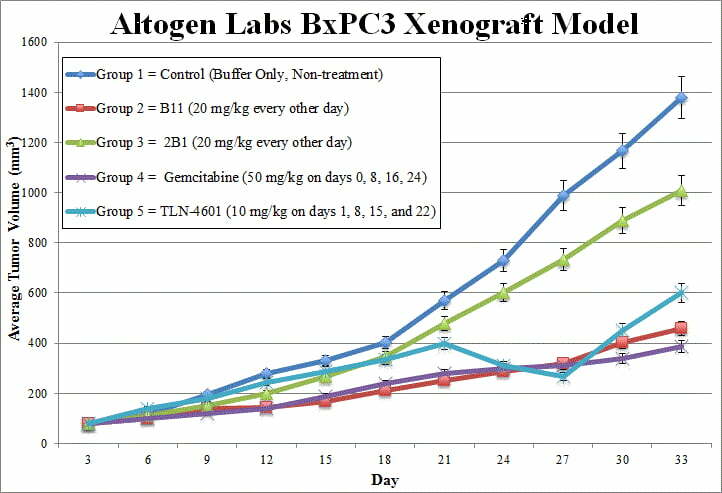 The BxPC-3 cell line (human pancreas) is used to create the CDX (Cell Line Derived Xenograft) BxPC-3 xenograft mouse model. The BxPC-3 pancreatic tumor model is a well-established model to investigate gemcitabine or small molecule tyrosine kinase inhibitors (TKIs), such as erlotinib. BxPC-3 cells used for injection are maintained at exponential growth up to injection. The BxPC-3 cells are trypsinized and then cell count and viability is determined using a trypan blue exclusion assay (98% viability required). Cell suspension concentration is adjusted to the appropriate density. Each mouse (NCr-nu/nu mice, 10 weeks old) receives a subcutaneous injection into the flank of one hind leg containing 1 million cells, in a volume of 100 uL of the matrigel & BxPC3 cell suspension. Injection sites are palpated multiple times weekly until tumor establishment. Tumors are measured with digital calipers to establish an average size of 50-150 mm3. Animals are then randomized into predetermined treatment cohorts the compound of interest is administered according to the treatment schedule. 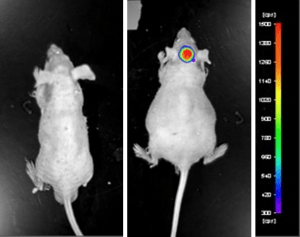 Tumors are measured daily and recorded, and mouse weights are recorded 3 times weekly. Animals are euthanized as tumor size reaches near 2,000 cu millimeters or the predetermined study size limit. Necropsy is performed as defined in the termination of experiment. Tumors excision, weight and an image is documented. Tissues are collected via standard necropsies for downstream analysis. All tumors and tissues can be frozen in LN2, prepared for histology or stabilized in RNAlater for gene expression analysis.